In this photograph we see a half-smashed house, its exposed rooms framed by shards of plank and drywall. Beyond it is blue sky and inside is a man in a sky-blue shirt, walking through a hallway as if the house was still intact, still a place to casually move around. The photograph catches the building in a moment of decomposition, when it has ceased being a house in the conventional sense (no longer properly habitable, fixable, sell-able) but remains, in some form, nonetheless. The house is in Youngstown Ohio, where it is part of a larger landscape of variously dis-inhabited, decomposed buildings. Some are half-smashed like this one, others slowly gutted, burned-out or rottenly unfurling. This opened architecture is the fallout of a series of recent chapters in American capitalism: corporate withdrawal from the project of city-building, intensifying general impoverishment, widespread predatory lending and the rise of a market in post-occupancy real estate. In Youngstown, encounters with these unfurling houses are part of daily life. It is a landscape at once ordinary and strange for residents, pervasive but continually surprising, a kind of unhomely everyday. Among other things, these houses have become spaces of work--the work of gleaning, stripping and demolition. The man in the photograph is in the midst of demolishing the house. He works alone, in plain clothes, taking the structure down chunk by chunk with a backhoe. It takes him about a week to finish the job. He is an expert in its decomposition. He knows where to hit, how it will fall and the best way to sort the remains. He does not treat the house as a place to live, but he is still 'at home' in it, knowing how to move with the structure as he pulls it down. For the social scientist, too, there is a relation between expertise and decomposition, in which coming to know something is often a process of pulling away layers or cutting in at an angle. The smashed house looks a lot like a diagram of a house one might find in an ethnography. 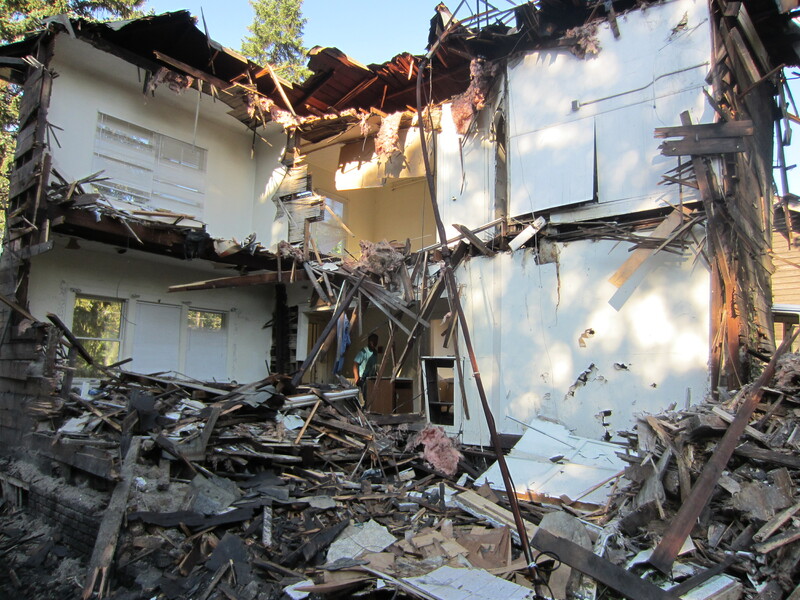 Like diagramming, demolition allows us to see the house in a way that would have been impossible when it was habitable. Half-destroyed, we can simultaneously see both interior and exterior, both first and second floor layout, and all the normally hidden structural layers-- beams, planking, insulation, wiring and so on. In the moment of its dissolution, the house reveals itself. And yet it also turns fantastic, surreal. If the above photo presents a social thing de-composed, prompting questions about the relation between knowing and ruination, Tanur's photo seems to offer us the opposite kind of scene. It presents a veiled object rather than an radically opened one, and raises questions about how to come to know the unknown. On the surface, the photo has a ringing clarity. The title names a specific, legible place, 'Florida Beach'. The composition is sublimely simple. Arranged in classic thirds, the steely blue sky mirrors the gray of the sand, and between them is the unquestionable subject of the photograph, repeating in slightly different hues, extending beyond the frame in both directions. But what is it? Or maybe 'what is it' is the wrong question. Someone familiar with this beach (or perhaps any Florida beach) would probably know what is under these blue covers. And yet knowing this fact, being able to explain the photograph in this way, wouldn't actually engage the force of the image. The subject of the photograph is not whatever lies underneath the covers, but the forms made by the covers themselves, which insist, in rhythmic repetition, that the viewer look at something without (yet) knowing what it is, that she rest in the space of observing the unknown. 'Florida Beach', like the image of the man in the half-smashed house, captures a kind of strangeness lodged in the everyday. In the first instance, an ordinary object has turned strange in the phase of its unfurling. In the second, Tanur has found sur-reality in a landscape of mundane objects by focusing on the phase when they remain stubbornly obscure. 'Florida Beach' suggests a different kind of ethnographic gaze than the one that would pull a house apart to really see it. Tanur's photo positions the viewer in the stance of someone new to a place, someone attentive to surfaces, intensities and patterns without yet knowing them in the way an inhabitant could. This resonance or spark that comes with being strange to a place is an important component of sociological inquiry. The forms that emerge in these moments of initial encounter often infuse social analyses with a poetic force that they would not otherwise possess. Passing along some thread of this initial unknowing, even as we seek to pull open and explain, is part of what we have to offer as observers of the social worlds we move through. If the previous photo presents a social thing de-composed, prompting questions about the relation between knowing and ruination, Tanur's photo seems to offer us the opposite kind of scene. It presents a veiled object rather than an radically opened one, and raises questions about how to come to know the unknown. On the surface, the photo has a ringing clarity. The title names a specific, legible place, 'Florida Beach'. The composition is sublimely simple. Arranged in classic thirds, the steely blue sky mirrors the gray of the sand, and between them is the unquestionable subject of the photograph, repeating in slightly different hues, extending beyond the frame in both directions. But what is it? Or maybe 'what is it' is the wrong question. 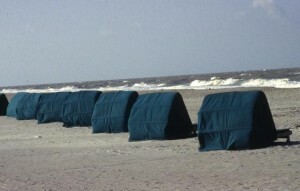 Someone familiar with this beach (or perhaps any Florida beach) would probably know what is under these blue covers. And yet knowing this fact, being able to explain the photograph in this way, wouldn't actually engage the force of the image. The subject of the photograph is not whatever lies underneath the covers, but the forms made by the covers themselves, which insist, in rhythmic repetition, that the viewer look at something without (yet) knowing what it is, that she rest in the space of observing the unknown. 'Florida Beach', like the image of the man in the half-smashed house, captures a kind of strangeness lodged in the everyday. In the first instance, an ordinary object has turned strange in the phase of its unfurling. In the second, Tanur has found sur-reality in a landscape of mundane objects by focusing on the phase when they remain stubbornly obscure. 'Florida Beach' suggests a different kind of ethnographic gaze than the one that would pull a house apart to really see it. Tanur's photo positions the viewer in the stance of someone new to a place, someone attentive to surfaces, intensities and patterns without yet knowing them in the way an inhabitant could. This resonance or spark that comes with being strange to a place is an important component of sociological inquiry. The forms that emerge in these moments of initial encounter often infuse social analyses with a poetic force that they would not otherwise possess. Passing along some thread of this initial unknowing, even as we seek to pull open and explain, is part of what we have to offer as observers of the social worlds we move through.